mm writes about the bleakness of winter, and the fragility of our over-developed lives. In the wet, cold darkness of the northern, recessional winter we fall prey to primitive fears. If that age-old market-place icon, Woolworths, can sink without much of a trace, so may we all. The gas may flutter in the pipes and die, the electricity snap off in an instant. Here is my small answer, my measure of highly-prized independence, my puny fist raised in protest against darkness, bleakness, and the appalling behaviour of the gas supplier. My small stove. It is dirty, it is gritty. It fills the room with a fine coating of ash, and when the wind is in a certain direction (south east), it may belch out clouds of smoke. The wind is seldom in the south east, and so it sits there, quietly glowing, the kettle simmering gently on its flat top. I love this stove. It's Danish. The Danes really know about winters, and wood, and warmth. The stove burns wood, or smokeless fuel, or both. Its small air-intake dials respond to finger-tip control. It needs care and cleaning, ash-removal and soot-removal. Above all else it needs feeding at regular intervals. I have wood in all shapes and sizes, from twigs to tree-trunks. I have fir-cones, dried cuttings from the vine, hanks of dried grasses. During the summer, like the old European widow of folk lore that I am fast becoming, I go out gathering sticks and pine cones. I stack logs in my tidy woodstore. It is so basic, so primitive, so in tune with nature to stock up for the coming months in this way. As the days grow colder I can warm up by cutting logs. I am hoping for a chain-saw for Christmas, as a concession to my advancing years. The smell, the texture of the logs, the skinned knuckles and aching back are all part of the primitive urge. My relationship with the stove is costly in terms of effort. What is the value of any relationship that does not cost effort? In return for the effort I have warmth. I have a sense of achievement, and a type of security. I cannot run up huge bills without realising it. If I have fuel, I will use it. When it runs out I will keep warm by acquiring more. If or when the gas and electricity supplies fail I can boil a kettle, heat soup, make toast. Some of my friends think I'm mad, or at best eccentric. I rather think I'm not. I'd love to have such a stove, and access to wood and woody droppings. Warm and sensible. Having been without electricity during blizzards, a non-grid method of making hot tea would have been wonderful. On the other hand, I grew up with a coal furnace and the black boogers that indicated I maybe shouldn't have been breathing in all that ash. Zhoen, yes, it's a mixed blessing, but it's probably the security of the stacked woodpile that I most enjoy. Soon I will become too mean to want to burn it! Love this. Thanks for the link, RR. We had a coke stove when I was growing up. Every morning in winter my father would rise at 6.30 ish, often with the window covered in frost patterning, and clean out the ashes. A noisy business anyway, the poker clattering on the metal, and he would whistle as he worked. So. I am not misty eyed about stoves. No illusions. They are dirty and do take work. But I am easily convinced of the merits of a wood burning stove, for all sorts of reasons. In fact my lack of stove and mild envy of yours was one of the factors that prompted my post! Yes, mm, doing the ashes is a good way to disturb offspring planning a lie-in overhead! Don't forget, there's a seat beside this stove if you need it - as long as the dog will move over. Yay! Chainsaws! If you do get one, keep it away from blokes if you value your trees. A bloke with a chainsaw will always find something to cut — sorry, something that needs cutting. PPete: I know, I know - it's a total bloke thing, but I'm hoping someone produces Lady Chainsaws in pink, with a touch of diamante round the handles. Would you be seen wielding one of those? Anyway - I NEED one, pink or not! I'm a LumberJill, and I'm all right! Ah, woodburners! I love ours. It's so efficient it only needs to have ash removed about once every three or four weeks and the brassicas in particular love this potash. Like you, R R, I know that if the electricity fails, perhaps because the hydro lakes have become too low, we will be warm, can cook, and still have hot showers. Our wood stove eats jarrah eucalyptus wood. In the winter I keep soup simmering on it's top and the hound curls around the stove's base. They are wonderful sources of warmth and I don't mind clearing out the ash. I leave the wood chopping to the other half though! Peregrina: every three weeks - that's quite a stove! The long handled axe with pink ribbon sounds good, as does the pink ribbon in your hair. You must, of course, be dressed in crisp gingham like Doris Day. Which implies that you should be singing, too! HHnB: the eucalyptus sounds wonderfully fragrant, but I note that you are not joining the select group of ultra-feminine wood-cutters! Oh dear, I'm ashamed to say that we have no stove. But I've just come across your blog and I love it. You write so beautifully and interestingly. I've just read your archives. How awful about the rock-throwers and how wonderful about the plans for flowers for your town. You just about had me weeping with your shed post. And your bookshop post had me smiling and nodding. I so much don't have time to read any more blogs but I must read yours. Isabelle: how kind of you to leave such a generous comment. It's lovely to discover your blog, too, and I look forward to a proper read soon. In the meantime I've enjoyed your Christmas activities - and I appreciate the Meconopsis! Sounds very sensible to me and you're right in that that you can fend for yourself in using nature's simplicity. Cheers to you! In France I had a very passionate love affair with my wood-burner and I miss it desperatley. I miss the tractor delivering wood, the stacking of each log and the lovely feeling of independence from EDF that it gave me. 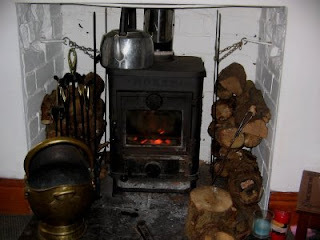 One day I will be the proud owner of another wood stove and spend cosy evenings in it's company!